MONDAY: 2 for 1 Wells, Calls & House Wines, 3-6pm. Miller Light Bottles $3, 6-Close. TUESDAY: 2 for 1 Wells, Calls & House Wines, 3-6pm. Corona & Corona Light Btls. $3.5 & Coach's Margaritas $5, 6- Close. HUMP DAY: 2 for 1 Wells, Calls & House Wines, 3-6pm. All Specialty Drinks $1 off, 6-Close. THURSDAY: 2 for 1 Wells, Calls & House Wines, 3-6pm. Kansas City Born Beers .50 off, 6-Close. FRIDAY: Bartenders choice....drinks or shots, no one knows till the bartender decides...always fun! SATURDAY: Milwaukee Bloody Mary for $12, 11am-2pm. Bartenders Choice All day long! SUNDAY FUNDAY: *Milwaukee Bloody Mary for $12, 11am-2pm. Micro & Import beers on special all day long! 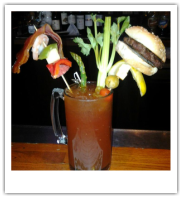 Our Coach's Bloody Mary Special garnished with a 1oz. Slider made to order, cheeses, bacon, celery, asparagus spear, onions, beef jerky, shrimp, red & green peppers and a pickle spear.